In my review of iOS 9, I noted how new iPad multitasking features lacked an important functionality that had long been available to desktop users: a way to view multiple screens of the same app side by side. Whether it's documents, conversations, or email threads, there's a clear utility in being able to split the same app in multiple instances, but that's currently not possible in iOS 9. I'd argue that the ability to view multiple webpages at once would be even more useful than the aforementioned examples. And that's exactly what Sidefari, a $0.99 iPad-only app released today by Francisco Cantu, wants to provide a solution for. 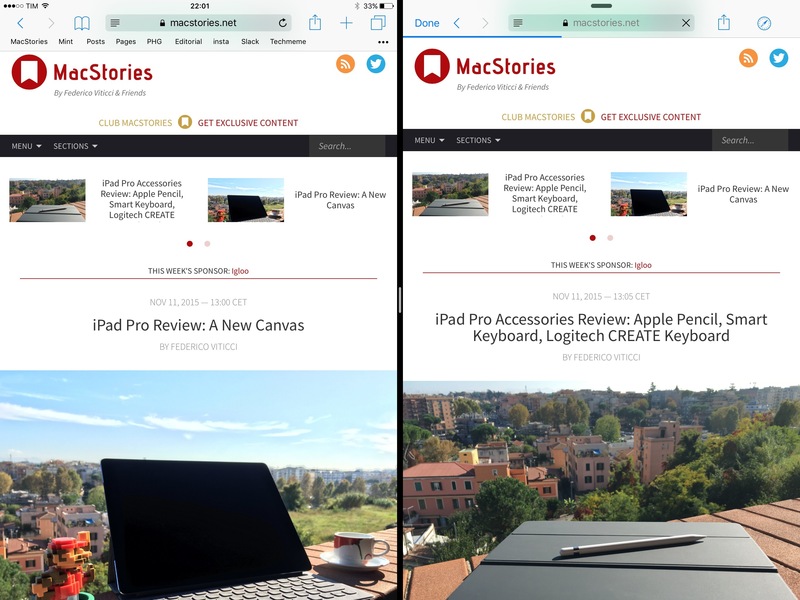 Sidefari uses Safari View Controller to let you open a second webpage in Split View on your iPad. Unlike Browsecurely, Sidefari doesn't display Safari View Controller on the top of the app you're currently using – it's been designed, as the name suggests, as a side companion based on the Safari web views introduced with iOS 9. Whenever you find yourself needing to open two webpages and view them simultaneously, you can invoke Sidefari from the Slide Over app picker and enter Split View. At this point, you have some options: you can use the Sidefari extension to send a webpage from the main app to Sidefari (which needs to be in Split View already to open the URL directly), or you can paste a URL into Sidefari and open the webpage from your clipboard. Sidefari can also hold up to 50 items from your history in the app, but this can be disabled in the Settings. Sidefari is a clever implementation of Split View and Safari View Controller, and it's only $0.99 on the App Store.